On Wednesday at the Texan Gaylord Resort and Convention Center, following MarketWaves18, members of the Blockchain in Transport Alliance (BiTA) met to receive updates on the organization’s progress toward data standards, hear announcements, share feedback, and learn about the work being done by BiTA’s think thanks. 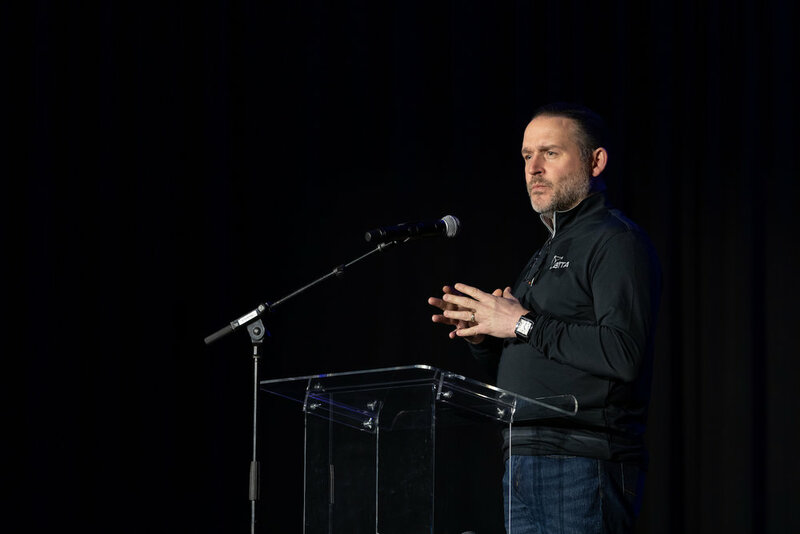 BiTA President Chris Burruss opened up the meeting by reflecting on his experience in organization management and commenting on the accelerated timeline BiTA has set for itself vis-a-vis other standards organizations. Burruss compared managing older trade associations to a fixer-upper job—the president looks for holes, throws in spackle, fixes the floors, and tries to get the house square again while preserving its original character. He likened launching a new trade alliance to new construction, saying that some contractors cut corners and things break before they should. “Standards creation is a process that we didn’t want to cut corners with,” Burruss said. “We’ve been in construction, and pardon our mess.” Burruss quoted the standards committee’s purpose statement. Typical standards bodies take two to five years to create a standard; BiTA plans to do it in about eight months, having officially adopted its standards model in March 2018. BiTA aims to release the first version of its blockchain standards by the end of 2018. “The goal is not to push something out, but to release standards that means something,” Burruss said. Next, BiTA Chief of Staff Arlen Stark moderated about an hour-long session in which individual BiTA members took the stage to talk about why they joined BiTA, what they were looking for from their membership, and the current state of their company’s blockchain journey. About thirty companies offered their feedback: these companies ranged from blockchain technology companies looking for clients in transport and logistics to very large corporations like BP (NYSE: BP) and Delta (NYSE: DAL) who were interested in buying and building technology. “Delta’s motto is that ‘no one better connects the world.’ We want to move the technology forward and benefit our customers. We’re looking to partner with other organizations, startups or incumbents, as we have with UPS,” said Veneetia Johnson, IT and Strategy Leader at Delta Air Lines. “BNSF Railway is interested in B2B data integration. We have a group tracking different technologies and proofs-of-concept with the goal to disrupt before we’re disrupted. Blockchain is the one technology on our list that’s a big networking technology,” a BNSF official said. “We have one of the largest blockchain teams in the world (more than fifty developers), and we’re focused on bringing our expertise to BiTA’s membership,” said Patrick Mutwale from DLT Labs. Wednesday morning, Susan Kearney from The Institutes RiskBlock Alliance announced that the insurance and risk management trade association was partnering with BiTA to share education, offer its industry expertise to BiTA members, and collaborate on blockchain advocacy. The Institutes is a leading risk and insurance knowledge group; the RiskBlock Alliance is an industry-led consortium collaborating to unlock the potential of blockchain across the insurance industry. RiskBlock focuses on accelerating time to market and adoption through real-world applications and impactful blockchain use cases. Members of the RiskBlock Alliance include BB&T, Farmers Insurance, Liberty Mutual, Geico, Nationwide Insurance, StateFarm, USAA, and many others. RiskBlock says that blockchain can grow top-line revenue, realize efficiency gains, accelerate time to market, improve customer satisfaction, save cost, and help mitigate risk in the insurance industry. We found this partnership exciting because of the potential in transportation to use IoT sensors, cameras, and computer vision to generate immutable records of driving behavior, both in and out of the cab. Quantifying risk on a minute-by-minute, granular level will not only lead to better driver coaching and interventions to prevent accidents, and simplify the claims process (i.e., allow a carrier to prove it was not at fault), but should also drive down overall insurance costs for trucking carriers who operate their vehicles safely. Omnitracs’ Brad Taylor leads the BiTA Standards Committee and spoke with BNSF’s June Arnold, Ampliflex’s Ben Korthai, and Pratik Soni from Omnichain about the work that committee has done. Taylor displayed many of the attributes for location and component that will be included in the tracking documents uploaded to the blockchain. Taylor went through the attributes for TrackableEntity, TrackableEvent, and Location, noting grayed-out attributes that were still under discussion. Pratik Soni displayed a diagram of the Location Component, which included attributes for geocoordinates, SPLC, and address. Dale Chrystie, Blockchain Strategist at FedEx (NYSE: FDX), spoke about the interoperability committee, pointing out that “Blockchain is a team sport,” and saying that, “we can’t get from here to there without working for each other. None of us individually can get where we need to go with these things.” Chrystie said that his committee was studying other industry blockchain standards to ensure that BiTA’s standards would be able to mesh with them. Scott Friesen from Echo Global Logistics (NASDAQ: ECHO) spoke about the finance and technical compliance committee, saying that smart contracts must be constructed in such a way that legal teams and auditors can sign off on them. Friesen said that the committee is looking at common language that can be inserted into smart contracts as clauses, for example language for force majeure and indemnity, and that part of the committee’s job was to make sure that that BiTA receives necessary advice regarding jurisdictions and relevant jurisprudence. Finally, the large assembly broke into smaller groups and went to conference rooms to hear a rotation of speakers from the four main think tanks in BiTA who are narrowing down the first use cases that BiTA will tackle and composing white papers. Jake Fields from Platform Science talked about the work done by the Operations and Asset Utilization think tank: the members of the working group have held 34 meetings for more than 300 hours, and conducted eight stakeholder interviews. Fields said that his group looked at three broad areas, including Driver Utilization, Asset Accountancy/Optimization, and Vehicle Health Records; then he explained the decision-making process by which his team decided to focus on building a smart contract for calculating and collecting detention/demurrage fees. Other top priorities for Fields’ team include building an ELD-platform-agnostic HOS driving record on the blockchain and a standard for vehicle health records based on maintenance events, parts replacement servicing, error codes, and leverage those efforts into VMRS, OEMs, and open vehicle code standards. Jamil Dewji from Learning Machine’s think tank is building a PoC for a Universal Driver Passport, that would allow drivers to control all their government and government-mandated driver documents, DOT certifications, medical releases, drug screenings, and CDL in order to make hiring faster and less expensive. Dewji said that his group still had work to do in documenting the entire range of hiring standards across the industry. Dewji said that currently, it’s more time-consuming to verify driver experience than criminal or traffic violations, because of the fragmentation of the trucking industry and the fact that so many small carriers go out of business or sell, so the cryptographic securing of those sorts of records could make a big difference in hiring costs. Jordan Graft from TriumphPay and Melissa Forman from eCapital LLC presented the work of the group working on payments and settlements processes. The think tank began its work on invoice presentment and settlement, but realized that it had to start sooner, at the load tendering and rate confirmation stages of the transaction. “Bringing the invoice approval out of the carrier’s ERP onto the shared ledger is a huge opportunity in terms of back office efficiencies,” Graft said, noting that many phone calls and emails from multiple parties were associated with invoice approval, an opaque process. Joseph Hudicka from Neurored and Eric Rempel from Redwood Logistics spoke about the difficulties of defining a useful scope for their ‘Monitoring’ think tank and asked for more engagement from the membership, who offered ideas during an open discussion. Hudicka spoke about taking spot market bidding onto the blockchain to facilitate an organically generated open-source market index where participants would share bidding information with select masking features.